Autism is a developmental disorder of brain dysfunction with patients exhibiting a characteristic set of behaviors including impaired reciprocal social interaction impaired verbal and nonverbal communication, a marked restriction of activities and interests, and abnormal response to sensory stimuli. A global incidence of 4.5:10,000 children is reported, with a 4:1 ratio of males to females affected by autistic syndromes. There is increasing evidence that autism is etiologically a heterogeneous disorder involving neurobiological alteration in central nervous system functioning. Anatomical aberations of the cerebellum have been verified by MRI and confirmed by autopsy in autistic patients, and are presumed to initiate in utero. The basic pathology underlying autism has not yet been delineated. Diagnosis usually occurs before the third year due to a display of aberrant behaviors, (1) evident from the first few weeks or months of life, or (2) evident after normal progressive development followed by a sudden loss of previously acquired behaviors (e.g. language). This rapid deterioration is typically reported to occur at approximately 12 to 24 months of age coupled with characteristics of the syndrome that may not have been evident earlier. Previous treatment of autism has primarily focused on pharmacological and/or behavioral therapy plus dietary and nutrition intervention. More recent applications involve allergy treatment and sound therapy (Auditory Enhancement training). Research has identified, and studied in isolation, autistic subgroups with abnormal biologic markers associated with immunologic, nutritional, and audiologic mechanisms, but there exists a void in current literature without a clear definition of their individual role in the autistic syndrome. In addition, there have been no previous studies on the combined investigation and possible interrelationship between these factors. This prospective study was initiated (1) to assess the biochemical and metabolic status, plus (2) to determine the efficacy of a multidisciplinary approach to treatment in a group of autistic children. The investigation will conclude a one year observation on September 30, 1993. An initial examination revealed normal weight and height for appropriate age index. The majority of children exhibited the typical allergic facies, allergic shiners, and clear thick post-nasal drainage. Also, most children showed overdeveloped primary and secondary sexual characteristics. Due to the age, hyperkinetic condition, and lack of cooperation of the children, it was initially difficult to adequately examine and obtain blood samples for analysis. To secure patient safety, it was necessary to complete the examination and blood draw under general anesthesia. However, with time and additional experience, we were able to examine and draw blood in our office without sedation. The office procedure involves 3 adults to safely immobilize the child on an examining table, leaving the physician free to examine the child and draw blood. Collection of blood from the antecubital fossa was secured with an 18-20 gauge intercath. To rule out the possible influence of general anesthesia on baseline blood analysis, we analysed blood from a group of non-anesthetized autistic children. Food dye reactivity was evident in 100% of the subjects: 67% orange, 58% red #2, 58% yellow #10, 50% red #3, 25% red #1, 8% green, 0% black. (Vitamin C, niacin, vitamin B12, phosphorus, magnesium, and iron were decreased in 8-25% of subjects. Thiamin, folic acid, and selenium were in excess of RDA for all subjects). Comparative analysis between dietary intake and cellular response of same nutrients revealed inconsistent patterns within the group. The decreased levels of vitamin A, C, folic acid (FIGLU), and vitamin B12 (MMA) appear to reflect similarities between dietary intake and cellular response. In addition, the discrepency between dietary intake and cellular response of thiamin (ETK), riboflavin (EGR), niacin (1-NMN), and vitamin B6 (EGOT) may indicate a greater metabolic need and/or dysfunctional uptake. 2. The lymphocyte trace metals showed disordered cellular response of calcium (33%0, chromium (25%), magnesium (42%), manganese (50%), selenium (25%), and zinc (33%). Elevated and/or decreased levels of zinc, manganese, selenium, and chromium have been implicated in affecting inhibitory immune response, with suppression of antibody synthesis in vivo/vitro. 3. 24-hour urinary amino acids (collected prior to sedation) also revealed patterns to include decreased tyroine, carnosine, lysine, and hydroxylysine in all subjects. Consistently decreased levels have been implicated in suppressed uptake of amino acids due to incomplete or dysfunctional digestion in the gut. In addition, of interest to our subject profile, is the essential role tyrosine plays as a primary precursor to neurochemicals dopamine, norepinephrine and epinephrine. 4. Plasma amino acids revealed group patterns to include 100% of the subjects. Elevated levels of taurine, GABA, aspartic acid, and decreased arginine were eident in all subjects. This pattern may be representative of both autism and autism under general anesthesia. The elevated taurine and GABA were consistent with both anesthetized and non-anesthetized groups (though significantly different). Aspartic acid was not 100% elevated and arginine was not decreased in the non-anesthetized group. Arginine appears to play a direct role in immune functioning. This discrepency of elevated aspartic acid and/or decreased levels of arginine in the anesthetised group may indicate a immunodepressive role in general anesthesia. 5. The lymphocyte fatty acid profile showed 100% tendencies to elevated linoleic acid (essential), decreased arachidonic acid (essential), and decreased levels of mono-saturates oleic, nyristoleic, palmitoleic, and palmitelaldic acids. These essential fatty acids appear to play a key role in immune function, with deficit and/or excess concentrations affecting immunomodulation. Also, linoleic and arachidonic acid effect cell membrane fluidity, which in turn influence cell permeability and the behavior of membrane-associated enzymes and receptors which control intra and extra cellular functions. The regulation of cell membrane fluidity is currently under investigation as a possible mechanism for general anesthesia induction. 2. Pancreatic enzymes were recommended with main meals throughout the 12 months for subjects exhibiting impaired digestive functions. 3. All patients diagnosed with leaky gut syndrome received a preparation combining an amino acid (L- glutamine), fatty acid (gamma linoleic acid), complex carbohydrate (N-actyl-D-Glucosamina), antioxidant (gamma oryzanol) and vitamin E. Recommended dossage: one tab TID between meals for 2 months. All children underwent play audiometry or traditional testing, pre-, mid-, and post-treatment. Each child participated in a ten day, 2 sessions per/day (1/2 hour per session with 4 hr/intervals between) training program. Pre-treatment UCL thresholds were abnormal in 75% of the children. 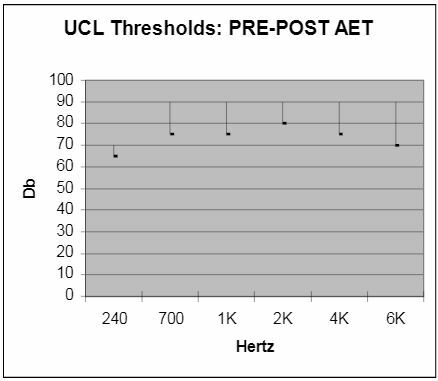 Following Auditory Enhancement Training, UCL threshold levels were within normal range (see insert). 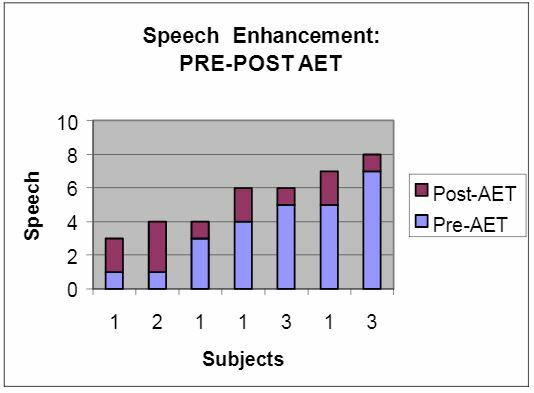 In addition, a positive modification in speech enhancement was observed in 100% of the subjects post-A.E.T (see insert). 2. Bio-nutrient:-Therapeutic support included a comprehensive multi-vitamin/mineral preparation plus amino acid supplementation as needed. This investigation has provided many curious and unexpected twists and turns in the ongoing inquiry of autism. In final viewing, it appears more questions have been raised versus answers given. As clinicians, we initiated this study with 12 autistic children and subsequently embarked on a year long venture of uncertainty, excitement, and hope. In final viewing, the clinical outcomes proved of value to our patients. American Psychiatric Association, Committee on Nomenclature and Statistics. Diagnostic and Statistical Manual of Mortal Disorders, 3rd ed, revised. Washington DC: American Psychiatric Association; 1987. Barbul A. Arginine and immune function. Nutr. (supp.) 1990; 6:53-58. Bendich A. Vitamins and immunity. J Nutr. 1992; 122:601-603. Besedovsky HO, Del Rey AE, Sorkin E. Immune-Neuroendocrine Interactions. J of Immuno. 1965;135:750-754. Beyreiss J., Roth N, Beyer H. Coincidence of immune (atopic dermatitis) and behavioral (attention deficit) disorders in children: empirical data. Activ. Nerv. Sup. 1968;30:127-8. Cellular & Molecular Immunology: Abbas AK, Lichtman AH, Pober JS, W.B. Saunders Company, London, 1991. Chandra RK, Nutrition and immunity: lessons from the past and new insights into the future. Am J Clin Nutr. ; 1991; 53:1087-1101. Cheng S, Brunner EA. Inducing anesthesia with a GABE analog, THIP. Anesthesiology. 1985;63:147-151. Children’s Nutrition: Lifshitz F, Finch NM, Lifshitz JZ. Department of Pediatrics, Cornell University Medical College, BY Jones & Bartlett Publishres, Boston; 1991. Coleman M. The search for neurological subgroups in autism. Neurobiological Issues in Autism. Plenum Press, New York, NY 1987. Coleman M. Nutritional treatments currently under investigation in autism. Clin Nutr. 1989; 8:210-212. Fletcher MP, Gershwin ME, Keen CL, Hurley L. Trace element deficiencies and immune responsiveness in humans and animal models. Nutrition and immunology. Alan R. Lies, Inc., New York, NY, 1988. Gershwin ME, Beach RS, Hurley LS –The potential impact of nutritional factors on immunological responsiveness. Nutrition and Immunity. Academic Press, Inc., New York, NY, 1985. Handbook of Autism & Pervasive developmental Disorders: Cohen DJ, Donnellan AM, Paul R., John Wilery & Sons, 1987. Hearing Equals behabior: Bernard G, Kaats Publishing Inc, New Canaan, CN, 1993 immunology: Kuby J, San Francisco State University. WH Freeman & Co, NY, 1992. Kinsella JE Lookesh B, Broughton S, Whelan J. Dietary polyunsaturated fatty acids and elcosanoids: potential effects on the modulation of inflammatory and immune cells: an overview. Nutrition (supp). 1990, 6:24-44. Klein A, Armstrong B. Hyperacusis & otitis media in individuals with Williams syndrome. J of Speech & Hearing Disorders. 1990; 55:339-344. Leucocyte Typing IV –White Cell Differentiation Antigens: knapp W (ed. ); Oxford University press, Oxford; 1989. Membrane Interactions with General and Local Anesthetics: A review of Molecular Hypotheses of Anesthesia: Dluzewski AR, Halsey MJ, Simmonds AC. Pergamon Press Ltd, 1984. Menage P, Thibault G, Martineau J, An IgE mechanism in autistic hypersensitivity? Biol Psychiatry, 1992;31:209-212. Raiten DJ, Massaro T. Perspectives on the nutritional ecology of autistic children. J Autism & Devel Dis. 1986;16:133-143. Recommended Dietary Allowances: Food & Nutrition Board. National Research Council: 10th ed., National Academy Press; 1989. Schreibman L. Autism. Newbury Park, CA: Sage Publications, Inc; 1988:2-78. Shapiro AC, Wu D, Heydani Sn. Binosanoids derived from arachidonic and sicosapentaenoic acids inhibit T cell proliferative response. Prostaglandins. 1993;45:229-40. Sherman AR. Zinc, cooper and iron nutritiure and immunity, J Nutr. 1992;122:604-609. Singh VK, Warren RP, Odell JD. Changes of soluble interleukin-2, interleukin-2 receptor, TB antigen, and interleukin-1 in the serum of autistic children. Clin Immuno & Immunopathology. 1991; 61:440-455. Slauson DO, Walker C, Kristensen F. Mechanisms of serotonin-Induced Lymphocyte Proliferation Inhibition. Cell Immuno; 1984; 23:112.21. Jeda I, Hirakawa M, Arakawa K. Do Anesthetics Fluidize Membranes? Anesthesiology. 1986; 64:67-71. Vernon J. Fathophysiology of Tinnitus: A special case –Hyperpousis & A proposed treatment. Am J of otology. 1987; 8:201-202. Warren RP, Margaretten N, Pace NC. Immune abnormalities in patients with autism. J Autism & devel Dis.1986, 16:189-197. Warren RP, Singh VK, Cole JD, Odell JD. Increased frequency of the null allele at the complement C4B locus in autism. Clin. Exp. Immunol. 1991;83:438-440. Warren RP, Foster A, Margaretten N. Reduced Natural Killer Cell Activity in Autism. J Amer Acad Child Adol Psychol. 1987;26:333-335. Allergy: please refer to traditional articles as recommended by the American Academy of Otolaryngic Allergy and the American Academy of Environmental Medicine. The Uncomfortable Loudness Thresholds (UCL) were obtained through soundfield. The lower bar of the arm was pre-AET and the upper arm was post-AET. Any frequency UCL below 90dBHL was labeled as hyperacusis. 75% of the subjects were labeled as hyperacusis pre-AET. Post-AET evaluations showed that 0% or none of the previous labeled subjects were hyperacusis. This was also correlated with parental questions on the Hearing Sensitivity Questionnaire pre-and-post-AET. This illustrates that the subjects were able to listen to louder or more intensified frequencies than before.